Cannes - home to the rich and famous with its casinos, festivals, fairs, beach and nightlife. It is of course one of the most busy, glamorous and fashionable of the Riviera resorts. The heart of the city is built around the palm-lined boulevard de la Croisette. However, this is not all Cannes has to offer, it is also rich in history. The old port is a mixture of colours and traditions, with the fishermen gathering in all the fruits of the sea. Nice - very popular at the turn of the century, it still boasts many buildings from the Belle Epoque era. Nice, bursting with elegance and style, is a wonderful city to stroll around, the beautiful seaside promenade affords wonderful views over the Mediterranean. A short drive along the coast and you arrive in Monaco, Europe's most famous principality. Sophisticated, chic and playground to the rich and famous, Monte Carlo combines the best features of a cosmopolitan city and a Mediterranean resort. Wander through the medieval streets of the old town to the harbour to admire the magnificent yachts and after sunset try your luck in the world famous casino. St. Tropez - miles of rugged scenery and beautiful sun-soaked beaches surrounding a series of chic resorts, it attracts thousands of visitors each year. Stroll along the dreamy port with its gleaming yachts and cruisers, browse the trend-setting shops or simply take in the magnificent atmosphere and spot the celebrities. St. Tropez bubbles with life and vitality and boasts undeniable style and sophistication. Nesting in the bay of St. Tropez is pretty Port Grimaud, a masterpiece of design, built in typical Venetian style, offering a fabulous array of bars, shops and restaurants interlaced by a network of canals and waterways. Sporting facilities are widely available such as scuba diving, sailing, windsurfing, tennis, golf and horse riding. There are daily Provencal markets in St. Maxime. Places to visit include the famous flower markets of Nice, the Miniature Park and Phoenix Park nature reserve in Nice, the Museum of Underwater Archaeology in St. Raphael. 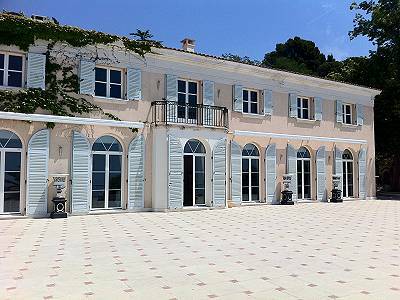 Magnificent New Villa with staff quarters on Cap d'Ail for Sale with 9 Bedrooms and Pool.